Exploring the city on foot is a delightful experience with much to see, including everything from old style wood-framed houses, clad in colourful corrugated-iron, mixed with a creative collection of postmodern architecture. The lively atmosphere generated by the activity in Reykjavík’s old harbour area is a new major attraction and the area makes for a pleasant stroll, as do any of the city’s many historic trails. You need not venture beyond the city limits to enjoy the nature! The city's wooded leisure areas offer peaceful walks and hiking in Reykjavík, such as Öskjuhlid, a hill adjacent to Reykjavik airport, and Ellidaárdalur, a valley in the east of the city. A stone’s throw from the city is the extensive Heidmörk nature reserve, with its splendid volcanic landscape, woods and spectacular views. Another lovely spot, offshore and just minutes away by ferry from Reykjavík is Videy Island. 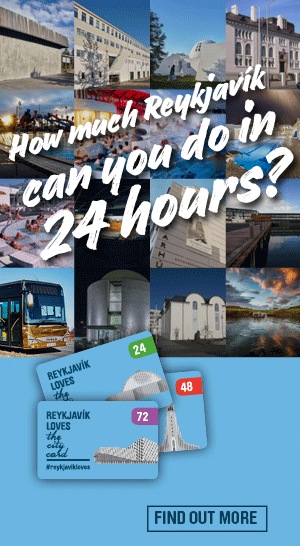 The Reykjavík City Card grants you a ferry ticket to Viðey, along with an all-access pass to museums and thermal pools within the city. To get the most out of your exploration of the city on foot, pick up a City Walks Map to guide you between the beautiful sculptures and numerous artworks, to the parks and hidden gardens, as well as the historic sites and landmarks.